We are thrilled to intimate you that Vijnana Bharati(VIBHA) has become the Guinness Book World Record Holder for the successful conduct of the ‘Largest Practical Science Lesson’. 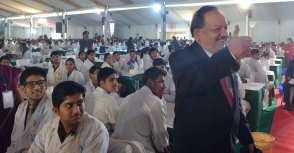 Dr Harshvardhan, Hon’ble Minister for Science & Technology and Earth Sciences and Smt. Smriti Irani, Hon’ble Minister for Human Resource Development addressed the students before the feat with their inspiring talk. The event was organized by Vijnana Bharati (VIBHA) as part of the five-day India International Science Festival (IISF) being jointly organized by the Ministries of Science and Technology and Earth Sciences. Dharmendra Kumar (Special Police Commissioner, Delhi), Arup Kumar Mishra (Director, Assam State Council for Science and Technology) and Akhil Ahamed (Former Vice Chancellor, Mysore University) were the official witness of the event. The previous record was held by 1339 students from Belfast, Northern Ireland. The event was conducted by Royal Society of Chemistry and was supported by British Council.